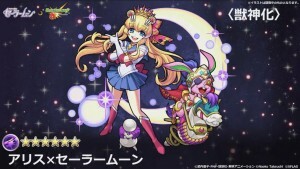 Is the art for the Sailor Moon Crystal x Monster Strike collaboration based on upcoming season 4 character designs? Characters from Sailor Moon Crystal will soon be appearing in the popular Japanese mobile game Monster Strike. What is Monster Strike? It seems a bit like StreetSmash, the Street Pass mini game in Super Smash Bros. for 3DS where you smash round pieces into others on a board. The characters will be appearing in the game shortly, meaning no specific date has been given. 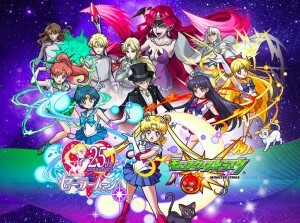 A number of images, available on the Official Sailor Moon site and Monster Strike web site, show that this will include Sailor Moon, Mercury, Mars, Jupiter and Venus, Tuxedo Mask, Queen Beryl, Jadeite, Nephrite, Zoisite and Kunzite. 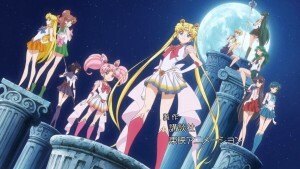 Some fans believe this art may be a first look at the designs of the upcoming fourth season of Sailor Moon Crystal. I’m not convinced. We have previously learned that Kazuko Tadano, who was a character designer and animation director for the first two seasons of the original Sailor Moon anime, would be doing the designs for the Dream arc of Sailor Moon Crystal. 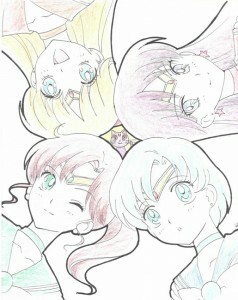 What her take on the series is remains to be seen however she did a sketch of Sailor Mercury, Mars, Jupiter and Venus back in 2013 which gives us an idea of what her art style is like more recently. 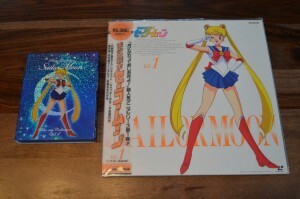 If you’re looking to see how she drew Sailor Moon back in the 90s note that she did all of the laser disc cover art, which has been used for home video releases over the last 25 years. So much to say the image of Sailor Moon most people think of matches her style. I frankly don’t see the resemblance here. The art style and almost comically large heads in the Monster Striker images just don’t seem to fit with either anything that Kazuko Tadano has put out or what Sailor Moon Crystal was doing. If I had to venture a guess I would say this art is made by one of the artists who has done other Monster Strike art over the years. Further by the very fact that we only have characters from the Dark Kingdom story arc shown here I don’t think it’s likely that these are new Sailor Moon Crystal designs. 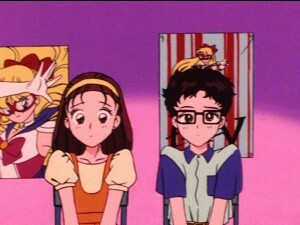 We similarly never saw any of the characters unique to the first two story arcs done in the style of Sailor Moon Crystal’s 3rd season. There is plenty of art from the Dark Kingdom arc which could be used for purposes such as these if that was the desire here. 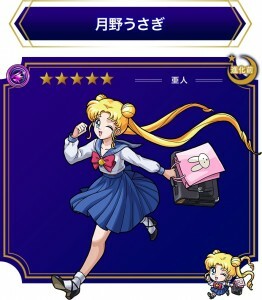 Instead this appears to be Sailor Moon Crystal in the style of Monster Strike. The super deformed or chibi versions with very large heads seem to fit with in game graphics of other characters. This is only my own personal assessment of the art of course! You are free to make your own determinations about what you think and these will be confirmed in 2065 when we get the two Sailor Moon Crystal Dream Arc films. 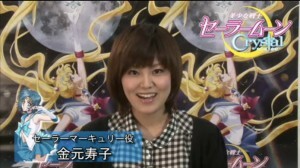 Further to the art shown on the web sites there was a video stream which showed the Sailor Moon content. Start watching the video embedded below at 11 minutes for the relevant content. This included a number of images of mash ups between Monster Strike characters and Sailor Moon characters. The only name I could decipher was Alice who is Sailor Moon. The other Sailor Guardians and Tuxedo Mask have gotten a similar treatment. In addition to being featured in this game there will be a number of Sailor Moon Crystal x Monster Strike products sold at the XFLAG store in Shibuya. This includes a number of food items. Do you play Monster Striker? Do you plan on playing the game when these characters are out? What do you think of the designs? Do you believe these are Sailor Moon Crystal Season 4 designs, Monster Strike style designs or something else? Keep reading for more art which will be used in the game. 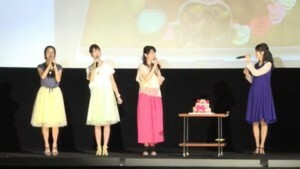 Yesterday there was a special live event to celebrate Usagi’s birthday, June 30th. 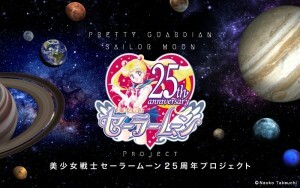 The main news pertaining to new Sailor Moon Crystal, which is what everyone has been waiting for, was that the upcoming 4th story arc or 4th season will not be presented as episodes but as two theatrical films. These will be played in theatres in Japan but it isn’t clear at this time what that means for international fans. Will we get the films in theatres ourselves? Will it be streamed online at a later date, perhaps split into individual episodes? A free simulcast seems a bit unlikely as there wouldn’t be much of an incentive to get people into theatres if the movies were available online on the first day. We will have to wait and see for more details as we still don’t have any timeline of when this might happen. After the event this information was posted to the official site. We’ve also learned that these two movies will be directed by Chiaki Kon, who was the director for the Infinity Arc of Sailor Moon Crystal. I really dug the animation style of the latest season so I’m happy to see her return, but it doesn’t look like all fans share that sentiment. The rest of the live event wasn’t all that compelling. Since it was Usagi’s birthday there was a cake and Happy Birthday to You was sung, which it seems is now public domain and not subject to copyright. There was also a new trailer shown for the upcoming Sailor Moon Le Mouvement Final. This included another look at the new characters from this musical. This trailer can be seen embedded below. 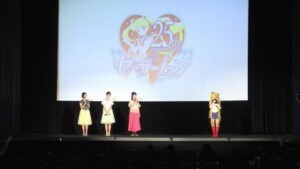 There was also a message from Naoko Takeuchi which was read by Sailor Moon’s voice actor Kotono Mitsuishi. No new information was included but it was about looking back at her time with the manga and thanking fans. This letter was also shared on the official site. This letter mentions that in 1992 she was 26 years old. This doesn’t match with many sources stating that she was born on March 15th 1967. If she was indeed 26 in 1992 this would put her year of birth at 1966. 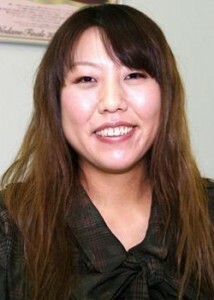 According to the Naoko Takeuchi Wikipedia talk page there are sources which indicate that she was born in 1966. It would seem plausible that this is in fact the case. 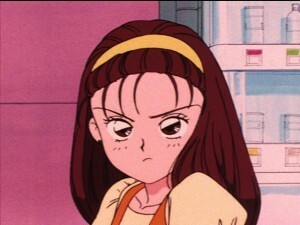 This would mean that my most viral Tweet where I wished Naoko Takeuchi a happy 50th birthday in March of this year was in fact wrong as she would have turned 51 this year. Without confirmation of her year of birth we can’t be sure one way or another. The most annoying part of the event was when they screened the intro and ending themes from the last story arc. This would have been a great time to see something new instead of something we’ve seen well over a year ago! For now we must continue to wait for more details about these two movies and what they mean for North American fans or the possibility of a Stars story arc. 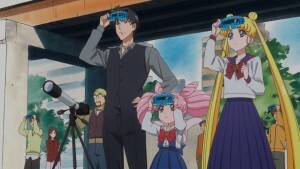 Sailor Moon fans have certainly learned to be patient with Sailor Moon Crystal! Today is June 28th 2017. The last episode of Sailor Moon Crystal which we saw was Act 38, Infinity 12 – Infinite Journey, on June 27th 2016. Surely we expected to have new episodes by now! Many fans are losing hope that we may ever see the Dream Arc of Sailor Moon Crystal but not all hope is lost. Later this week, on June 30th to celebrate Usagi’s birthday, there will be a live event in Japan. We don’t know what this live event will involve but it is possible that, after a long Sailor Moon Crystalless year, we might be getting some information about the upcoming season! 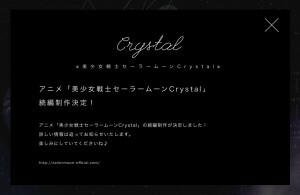 The last official thing we heard about the 4th season of Sailor Moon Crystal was back in January of this year when the Official Sailor Moon Site was updated to reflect the 25th Anniversary. This update included a mention that production would continue. No further details were mentioned and 5 months have since passed. 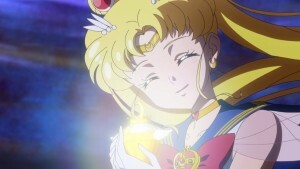 Does the light of hope for Sailor Moon Crystal’s continuation still exist in your heart? 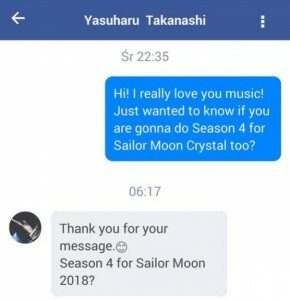 A couple of screenshots of alleged conversations with Yasuharu Takanashi, Sailor Moon Crystal’s music composer, are suggesting that Sailor Moon Crystal’s 4th season will be airing in 2018. People in the fan community are referring this as a rumour of further delays for the upcoming season. As rumours go, this one doesn’t seem to have much weight to it. I’m reporting this as it’s being discussed in the fan community and I wanted to weigh in on it’s legitimacy and not because I think there’s much validity to the rumour itself. Let us look at the evidence provided and consider how reliable the claim is. I originally saw this in a Tweet by Twitter user Chase the CHECH (@iHasMangic) who included two screenshots. The first is from a Facebook Messenger conversation. When asked if season 4 was coming he stated “Season 4 for Sailor Moon 2018?”. The question mark is a bit questionable. The profile image and name match that of Yasuharu Takanashi’s Facebook profile. The second screenshot is of an Instagram conversation. When asked about the possibility of a 4th season in 2017 he responds “2018! (smiley face) (thumbs up)”. Again the user name, in this case @nassy_takanashi, and profile photo match his Instagram profile. Since originally posting this I’ve been in contact with the user who posted this to Twitter and Adrian, the user who originally had these conversations. Adrian also posted these screenshots to the Pretty Guardians Facebook group and a post on the Genvid Forums. These include alternate screenshots of the same chats. We can ask ourselves a few questions. Are these screenshots legitimate? 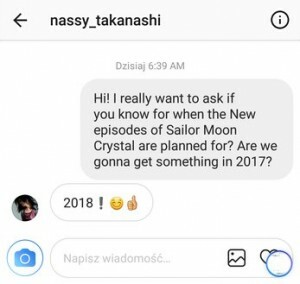 Is Yasuharu Takanashi indicating that Sailor Moon Crystal is delayed until 2018? If he is, is such a claim a reliable indication that the series is indeed delayed? I can’t make any certain claims about the authenticity of these screenshots. One could easily fabricate something like this, but would they? If I were going to fake a screenshot I might attempt to make a more clear confirmation without confusing question marks and emoji, but then I’m not in the business of doctoring screenshots these days. With matching avatars it doesn’t seem out of the question that these are legitimate. Having seen a number of different versions of these screenshots and spoken to Adrian about it I don’t think there’s much of a reason to doubt the validity of these. If they are indeed real screenshots, what is actually being said? The language is a bit confused but it does seem like Yasuharu Takanashi is indicating that, in his opinion, the series will be continuing in 2018. If this is indeed what he means, we can again ask ourselves if that is a reliable source. 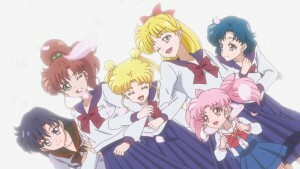 Yasuharu Takanashi composed the music for the first three seasons of Sailor Moon Crystal. It is entirely feasible that he will continue in this role if the show should continue, and we’ve received indication via the official Sailor Moon web site that more Sailor Moon Crystal is coming. As someone working on the show he may have an idea of the schedule. He may not as well. He may have been working on the show, be working on it now or be scheduled to work on it in the future and not actually have a specific idea of when the animation, voice acting and other production work will be completed and when the final distribution is scheduled for. If he did actually know when the show would be coming he may not be at liberty to disclose this. This chat isn’t a confidential discussions between professionals or close friends but rather a fans who reached out and got an answer. Take it all with a grain of salt! If others weren’t reporting on this I wouldn’t have bothered to post about it myself but as it’s being thrown around I wanted to share it for context. There are a lot of ifs going on. If they all turn out we may be getting new episodes in 2018, but with so many unknowns I wouldn’t make any certain conclusions about this actually happening. I tend to only give consideration to information shared through official sources such as those posted on the Official Sailor Moon site. Even when we get information through official sources we’ve seen that such situations are likely to change anyway. For now the only official word we’ve gotten is that more Sailor Moon Crystal is planned and we have gotten no timeline of when this would occur. As always if we hear anything official on this topic we will be sure to share it as soon as we can. 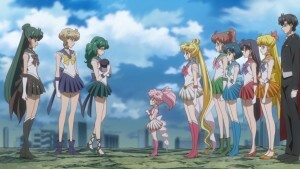 We have decided to produce the sequel of anime “Sailor Moon Crystal”! So it looks like the series will be continuing in some form, and as usual we are asked to wait for more information. Will this be the Dream arc, continuing the story where it left off, or something different? More news as we learn it! Are you excited about the 25th Anniversary? I wonder if this one will go on until the 30th Anniversary! The entire Infinity arc of Sailor Moon Crystal is now available to view online. The final episode we’ll see for a while, Act 38, Infinity 12 – Infinite – Journey aired on Japanese television on Monday June 27th at 11pm Japan Standard Time. Immediately afterwards it was available to view on Crunchyroll, Neon Alley and Hulu, starting at 10:30am Eastern Time. This week is a bit of a mixed bag as we wrap up the story of Sailor Uranus, Neptune, Pluto and Saturn and then move on for a teaser of the upcoming Dream arc. We still have no official confirmation that this new arc will be adapted. This episode is just doing exactly what the equivalent manga chapter did. While it seems likely at this point that we will be seeing more episodes this would certainly not be the first show to have a really awesome cliffhanger final episode which we never saw a follow up to. As always we start with an unreasonably long flashback! This week’s spans 3 minutes and 13 seconds which covers half of the last episode! 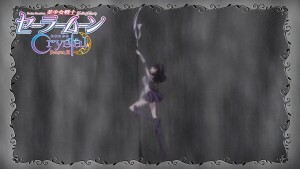 At least we see a lot of Sailor Saturn. 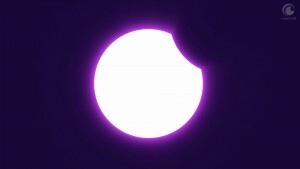 The opening theme, In Love With the New Moon, is the first version sung by Etsuko Yakushimaru. The full length version of this song is also heard in the episode itself. This is my favourite version of the opening so it was nice to hear. The ending theme used is Eternal Eternity sung by the voices of Sailor Uranus, Junko Minagawa and Sailor Neptune, Sayaka Ohara. Sailor Moon blasts out of the Pharaoh 90/Mistress 9 monster juice thing and in doing so causes some damage. She gives everyone super transformations! Well almost everyone. How come Tuxedo Mask doesn’t get an upgrade? He’d look great in some transparent shoulder pads! Poor guy. At least he has his male privilege to fall back on. Sailor Saturn, who was supposed to be destroying the world at the end of the last episode, decides to attack Pharaoh 90 and go to her death. She turns and smiles to her friends just like Sailor Moon had last week. This was a nice touch, as both seem willing to sacrifice themselves to save others. 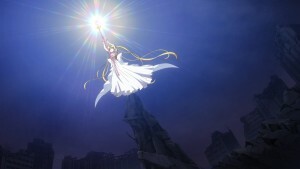 Sailor Moon becomes Neo Queen Serenity. OMG she was the one we saw in the visions. 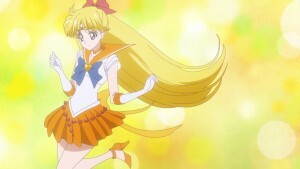 This isn’t the future version of Neo Queen Serenity possessing Sailor Moon in some way. 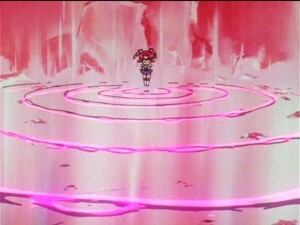 This is Usagi in full control of her faculties. There’s no other consciousness in there. So I wonder why she doesn’t seem to remember what happens. 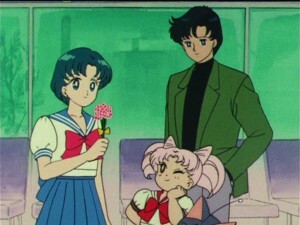 Sailor Moon asks where this baby came from, and Sailor Uranus basically says it’s “From precious you”, which no doubt is a terrible translation, but basically she believes that Neo Queen Serenity caused Sailor Saturn to reincarnate as baby Hotaru. Sure. The original Queen Serenity is the one that sent everyone to reincarnate in the present time after they were all killed. 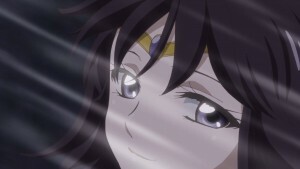 Future Neo Queen Serenity is the one who sent Sailor Pluto back in time to reincarnate as Setsuna. 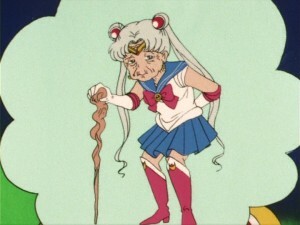 It stands to reason that Sailor Moon, the present version, is the one that did this. There’s no other consciousness which is doing stuff here. It’s not insinuated that old lady uploaded consciousness computer simulated Queen Serenity on the Moon has any real power here. 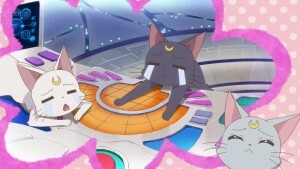 Why doesn’t Sailor Moon have full memory of doing this? It doesn’t really add up to me. 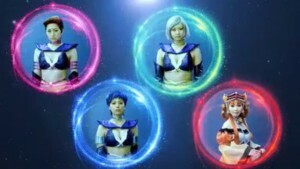 Sailor Uranus, Neptune, Pluto and Saturn leave and then we have a commercial break. There’s meant to be a massive passage of time here but I don’t feel that this is well conveyed at all. In the original manga the Infinity arc concludes here which is the end of a chapter. Following this we get The Lover of Princess Kaguya side story which is a full manga book which is the equivalent of the Sailor Moon S movie, which then has a side story about Rei. There are a bunch of other side stories published later which are understood to take place during this break which is basically the time when the girls are preparing for their high school entrance exams. 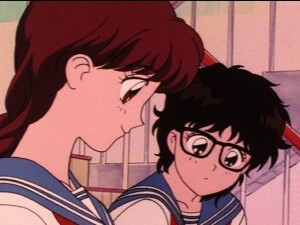 Ami’s First Love, which was adapted in an anime special, falls into this period as well. The first three story arcs all follow one another directly, but the Dream arc was never meant to do so. When the manga was rereleased in 2003 the chapters were broken up differently so they ended up breaking this particular Act up very poorly so that this passage of time isn’t properly demonstrated and happens between pages of the same story. I think Sailor Moon Crystal had a good chance to pace things out a bit differently and have the season end here, but they didn’t do that and instead, it’s time to go to high school. This episode is kind of like the first episode of Sailor Stars from the original Sailor Moon anime. Those first 6 episodes of Sailor Stars basically fix the problems that the SuperS season skipped, including some characters which will be returning later in the Dream arc. The girls are supposed to be in high school before meeting Pegasus as we see here. Most of the girls have Juban High School Uniforms. Rei does not, as she goes to her own school which does not use high school entrance exams. We don’t really have an equivalent to these in the West. I suppose maybe the SATs are something similar but as a Canadian this is also something I only know of through TV and movies. I’ve never had a test so important in my schooling that it required me getting addicted to caffeine pills like Jessie Spano. So much to say Japanese high school entrance exams are a big deal and the source of a lot of stress, and the girls are meant to have been preparing for this during the long period covered by the commercial break which we don’t even get in the streaming version. 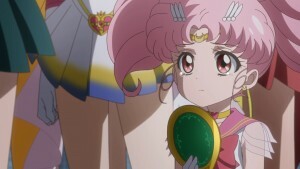 Chibiusa says she’s going to leave on April 1st, at the time of a Solar Eclipse. The next Solar eclipse that will occur on April 1st is in 2098 and there certainly wasn’t one in the 90s when the manga was written, but this is pretty nitpicky even for me. She mentions in her letter to her mother “Please come to pick me up”. How exactly does this work? 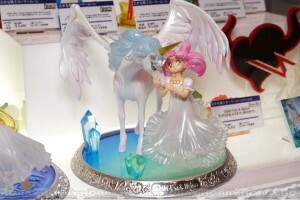 Is Neo Queen Serenity from the future going to travel to the 30th century to come pick up Chibiusa? 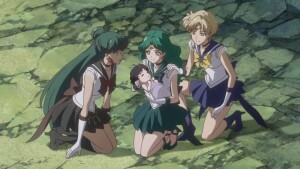 Who’s guardian the Space-Time Door with future Sailor Pluto dead and Diana in the past? Speaking of Diana! 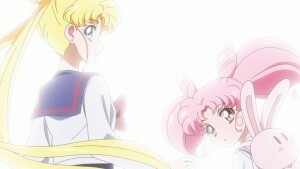 Usagi says to Luna, who isn’t present when this is said, that she will see Diana “very soon”. What does this mean? From the frame of reference of Diana then she would see her parents soon, in the future. From Luna and Artemis’s point of view they won’t see her soon at all. Diana is a kitten. Chibiusa, who is born in less than a decade, is 900 years old in the 30th century. Is Diana a permakitten born in the 20th or 21st century and never aging? Permakittens would revolutionize the pet industry! Kittens are most of the reason people have adult cats! So the gang are watching the eclipse and they hear a bell. They turn around to see… Pegasus! 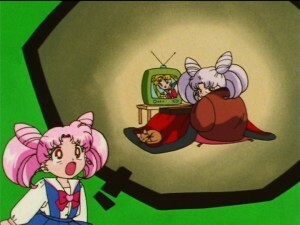 Well we don’t see Pegasus but in the manga version of Act 38, the final image has Usagi and Chibiusa seeing Pegasus. There’s no preview for another episode, but we will likely at some point be seeing Act 39, Dream 1 – Eclipse Dream. This will be part of the 4th story arc which, if current trends continue, will likely be referred to as Season 4 or Season IV in Japan. I’ve still been calling them arcs or phases but I may start using the term season if that becomes well established. We have no specifics on if and when we might get new episodes but perhaps we will learn something tomorrow at the live event to celebrate Usagi’s birthday. Keep reading for more screenshots from this episode. The Infinity arc ends this week! Sailor Moon Crystal Act 38, Infinity 12 – Infinite – Journey, will air on Japanese TV Monday June 27th at 11pm Japan Standard Time. Immediately afterwards it will be streamed on Crunchyroll, Neon Alley and Hulu starting at 10:30am. This is the final episode in the current story arc. After this we will likely not have any new episodes for a while. Some viewers have remained optimistic that we will be following directly into the Dream arc next week but I don’t think this is likely. We have received no official confirmation that there will be new episodes. We don’t have any cast information or art. We’ve had information about CDs, home video releases and all other sorts of tie ins to the Infinity arc, referred to commonly as season III, but nothing about the Dream arc or a season IV. I think more episodes are likely at this point, but barring any official confirmation we can’t say with certainty that this will happen and we have no idea of when this might occur at this time. When we left off last week Sailor Moon was dead and Sailor Saturn was destroying the world. How will the gang manage to avoid dying and having the world be destroyed? What happened to Sailor Moon? Will she be holding someone in her arms?! The answer to this and more in Act 38! The International Tokyo Toy Show is on now, running from June 9th to the 12th. 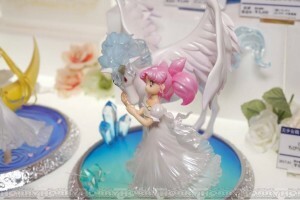 One thing which has been revealed is this great looking Figuarts Zero statue featuring Chibiusa and Pegasus from the Dream arc of the Sailor Moon manga. This on its own is not odd as we’ve gotten a lot of figures from throughout the Sailor Moon series in the past couple of years, not all of them tied to stories being told in Sailor Moon Crystal. 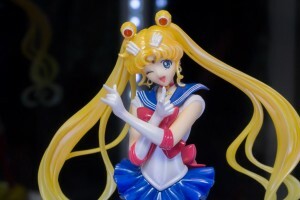 Something important to note though, as noticed by the Moon Sisters Facebook page, is that the sign for this statue refers to it as a Sailor Moon Crystal figure. We are currently seeing the Infinity arc of Sailor Moon Crystal and we’ve had no official confirmation of episodes covering the next story arc, the Dream story arc, which covers the manga chapters which were adapted as Sailor Moon SuperS in the original Sailor Moon anime. This isn’t just branding. The Figuarts Zero statues have had two distinct lines of figures. The Sailor Moon figures are in a style closer to that of the original anime and the Sailor Moon Crystal figures have designs that colours that match those used in Sailor Moon Crystal. It’s hard for me to tell what style this figure is in. The main indicators of a Sailor Moon Crystal specific Figuarts Zero statue are the colours, such as Sailor Moon being a bit more pink in her reds, and some proportions. Without two Chibiusas to compare this figure to there isn’t much to go on. Her dress does not use standard colours. Her legs are hidden so we can’t see their shape. The face does look a bit more like the rounder Sailor Moon Crystal Figuarts Zero statue than the normal Sailor Moon statue. Have a look at both below to see the difference. Is this conclusive? Absolutely not. Many things could mean this does not actually indicate that the Dream arc of the manga will be adapted in Sailor Moon Crystal. Perhaps someone just made the sign incorrectly. Note that it says Chibi-Usa and Helios but this is clearly Helios in his Pegasus form. 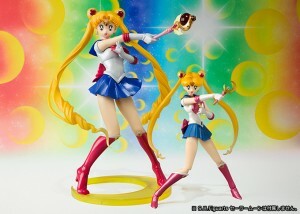 We don’t call something an Usagi figure if she’s in her Sailor Moon form. Perhaps the toy is done in a Sailor Moon Crystal style but does not reflect any plans to actually adapt these particular episodes. Figures take a long time to sculpt and approve. Perhaps when this figure was originally conceived and approved there was no indication of what the future of Sailor Moon Crystal might bring. Perhaps when the figure was planned there was an expectation that the Dream arc would be adapted but since then any number of complications has put a halt to development of those episodes. Perhaps there’s some other scenario I’m not even thinking of that is causing a disconnect between what this figure represents and what we will see in the show. There are a lot of unknowns so we should always wait for official confirmation before jumping to conclusions. 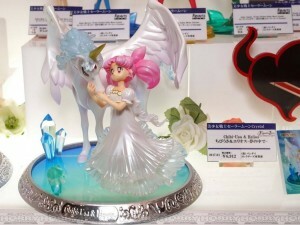 That said, we may very well be getting our very first look at Pegasus from Sailor Moon Crystal! The figure is due out in January and will sell for 6912 yen, about $65 US.